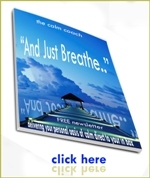 Free newsletter every 2 weeks that includes hints and tips, coaching tools, practical resources and feature article delivered directly to your in box. Would you like to find out how to improve certain components of your current lifestyle? By just taking a few minutes to complete this on-line quiz, you will be able to see which areas of your life are in good shape and those you might need a little help with. Would you like to regain 2 hours a day? This report provides you with a list of handy hints and tips on how to increase the time you have during the day and how to use it to best effect. Wouldn’t you like to feel you had complete ownership of your personal space? In this report you will find ways to enhance your existing space and possibilities for increasing it. Is your energy being zapped by people, habits, work and life in general? Then take a look at the following article to see how you could reclaim back some of that lost energy. Self-care is a basic human right and is synonymous with self-love and we could all do with giving ourselves much more of this. Self-care includes both internal and external factors, and this article outlines ways for you to improve your current level of personal self-care.